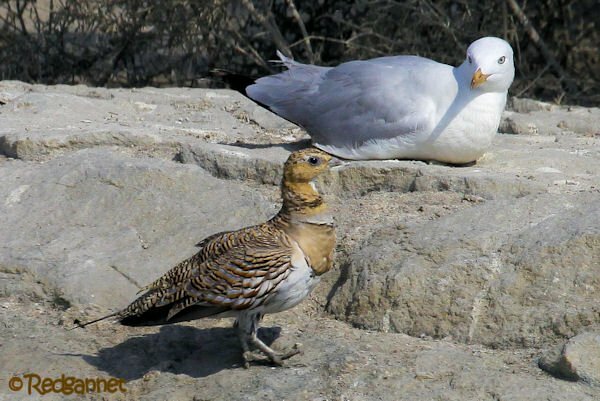 A Pin-tailed Sandgrouse flew across the front of the hide and landed on the other side of a freshwater sluice, just a few meters away under the watchful eye of a Slender-billed Gull. A security guard who mans the hide had spotted it earlier and pointed it out, but at the time it was quite a long way off and in a small hollow, making it difficult to identify. Not very many hides come with their own defence personnel. This one was at the Ras al Khor Sanctuary in Dubai where a “caretaker” is employed to ensure that visitors to the hide are safe, that they respect the birds’ refuge and don’t run off with the scope which is provided free of charge. I had selected automatic white balance on my camera, but in review the first few pictures lacked colour and warmth. The day was well advanced and the bright sun was burning out the shots. I changed to a warmer temperature setting for white balance and compared the reviewed shots with the actual scene in front of me. They appeared to be much closer to reality than the AWB had achieved. Now that I see them on the computer, I doubt that the colours were as intense, but my eyes, much like my normal grip on reality, may have been unreliable. Anyway, back to the bird. 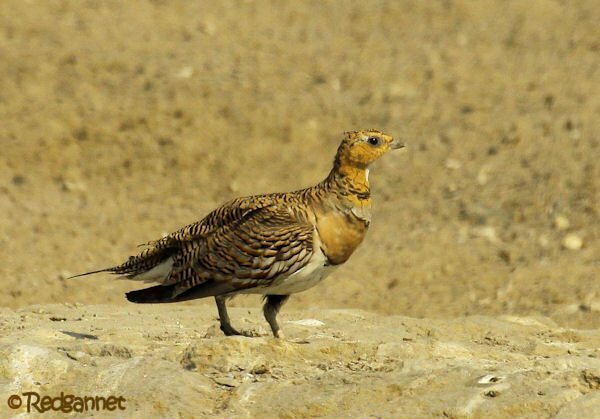 The Pin-tail Sandgrouse, Pterocles alchata, is a bird of the dry lands, inhabiting stony semi-desert and plain. The bird featured today is a female of the eastern race P.a. caudacutus which includes northern Africa and the Middle East within its range. It was introduced into UAE. The nominate form can be seen in Spain and southern France. Much of the water at Ras Al Khor is brackish, pushed up by the tide, but at the mangrove hide, there is a freshwater outlet and it was for this that the bird had come. They are often associated with areas of cereal agriculture. They will eat new green shoots as available, but much of their diet is made up of dry seeds, so a reliable source of fresh water is important. Something strikes me as I write; the sluice was opened up and freshwater was allowed to flow just as the bird arrived. 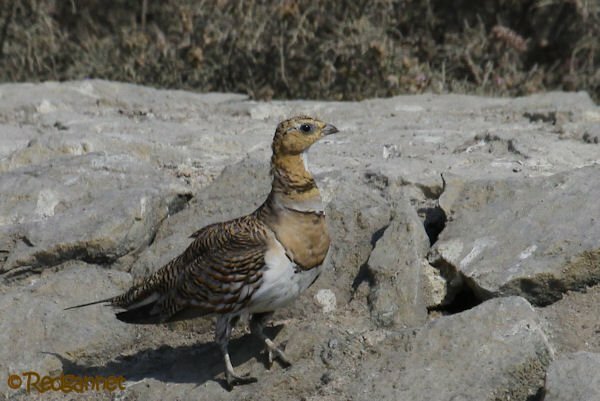 Sandgrouse are generally noted for visiting water in the early morning, late evening or nocturnally. This occurred close to midday. I wonder if the sluice is opened at the same time each day and she timed her arrival. Another thought; the tide had just turned. Was the sluice closed to prevent salt water flowing upstream? If so the sluice would be operational at a different time each day depending on the time that the tide receded below the sluice gate. 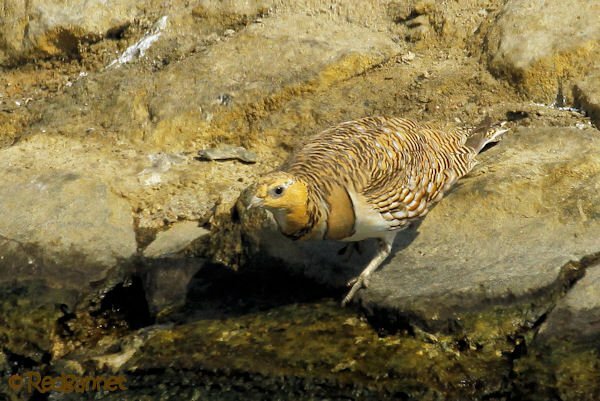 What do desert-dwelling sandgrouse know of tides, I wonder? This is simply musing unless anyone knows any better? 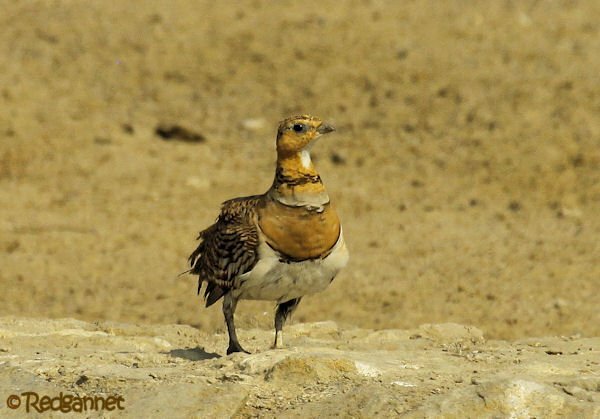 Sandgrouse are famed for having breast feathers that can absorb water which is carried back to chicks in their waterless habitat. They are noted for flying many miles to a freshwater source to provide water for their young. In keeping with most of the species in the genera, it is only the male that carries water. He will take over parenting duties while the female fends for herself. So it was with a sense of something missing that I watched her take a drink. 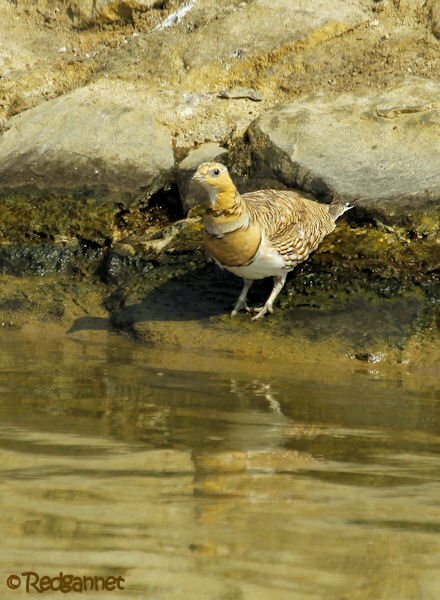 Sandgrouse will often arrive at a waterhole in large groups that form en-route. In company, there would be many eyes to keep watch for the local Greater Spotted Eagles and other predators. They can drink their fill quickly by tipping their heads back, allowing the water to flow into their crops, but on her own she had to keep returning to the top of the bank between sips to maintain a look-out. In my opinion, this is one of the world’s most beautiful birds, especially the males. I’ve only ever seen thwm once, back in 1995 in Spain, and am thus rather envious of your observation. Wonderful images! 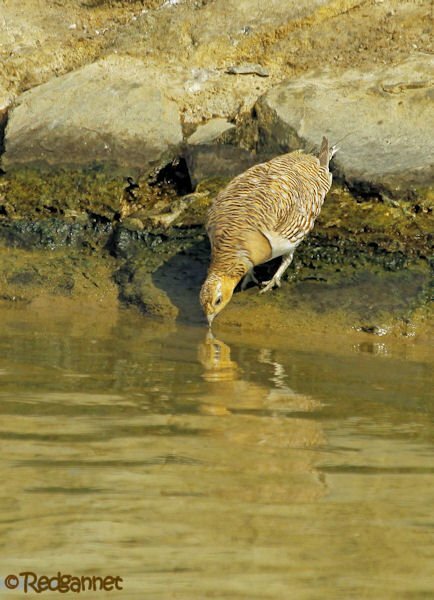 Sandgrouse and the way they carry water back to their chicks were featured on the television series, Earth 2. I’d love to visit this hide.